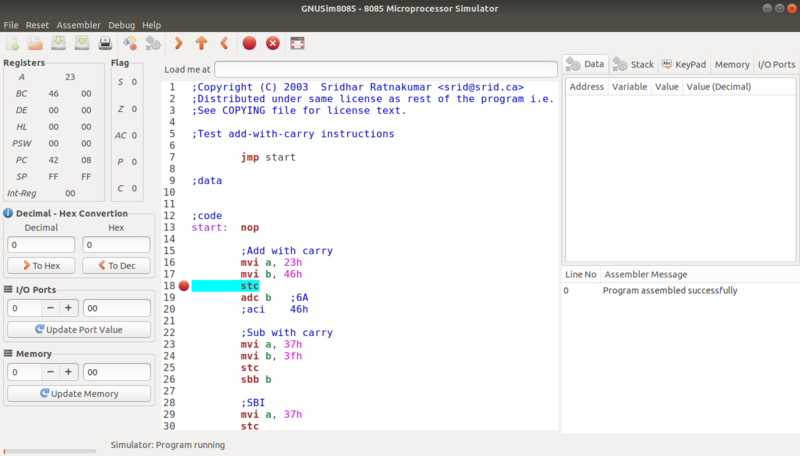 GNUSim8085 is a graphical simulator, assembler and debugger for the Intel 8085 microprocessor in Linux and Windows. A simple editor component with syntax highlighting. A keypad to input assembly language instructions with appropriate arguments. Easy view of register contents. Easy view of flag contents. View of stack, memory and I/O contents. Support for breakpoints for program debugging. One click conversion of assembly program to opcode listing. UI translated in various languages. Please open an issue in Github.